Nigeria Professional Football League (NPFL) side Rivers United and chemical and specialty fluid management company Eunisell Limited is continuing their front-of-shirt partnership for another year. The front-of-shirt sponsorship by the chemical firm remains undisclosed, according to officials of Eunisell. Rivers United general manager Okey Kpalukwu expressed happiness with the "gesture" of Eunisell in continuing with the partnership with the Port Harcourt club ahead of the new season. Kpalukwu made a bold call that the club are in the hunt for trophies this season and promised they will win the NPFL to better their second-place finish of last season. "We want to commend Eunisell for this gesture of theirs and we intend to make them proud for identifying with us. This very good gesture of theirs will spur us on to do very well on the continent in the Caf Champions League. This season, our target is to win the league. "Hopefully our aim to better our performance of the past season will ensure that this partnership continues well into the future and become bigger than this," Kpalukwu said. The company's group managing director, Chika Ikenga, said the performance of Rivers United last season impressed the firm and it hopes that the club will up the ante this term. Ikenga believes that Rivers United can build on their recent success of finishing second in the NPFL last season behind champions Enugu Rangers to become champions on the continent as well as claim the title in Nigeria this term. 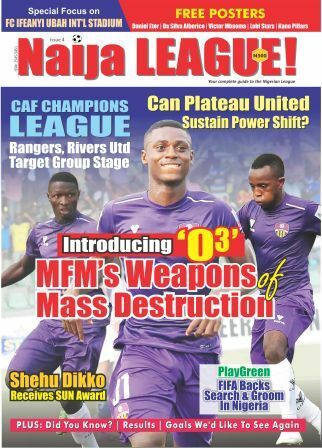 "We are very pleased with Rivers United for their recent achievement. Their fans have been fantastic and we hope they can reward them with the league title this new season. "Our encouragement stems from the good performance of Rivers United and we have decided to keep our promise to stay with the club as shirt sponsor irrespective of the present economic situation in Nigeria. "At the same time, we are very confident they will build on their recent successes to become winners of the NPFL as well as win on the continental front," Ikenga said. Eunisell also rewarded the club with N10 million, which is not part of the sponsorship deal, but to encourage the club, according to Ikenga. Eunisell began its front-of-shirt sponsorship with Sharks in 2015 before the Rivers State government decided to merge the Blue Angels with city rivals Dolphins to become Rivers United in February 2016.